Blue Bus Creatives is more than just a photo booth company - they can also take care of your wedding film and graphic design needs. Check out their website or Facebook page to see some of the beautiful weddings they have filmed. Nope, your eyes are not mistaken. 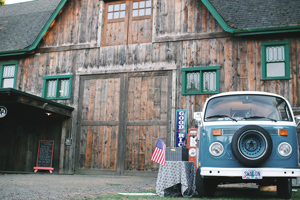 That certainly is a VW Bus you see to your right - introducing a new, mobile take on the old photo booth that you and your guests are sure to love (and tweet about). Meet the PhotoSwagon: a renovated 1973 Volkswagen bus turned mobile photo booth...one of the most unique photo booth experiences you and your guests will ever have! Grab a friend (or six) and hop in the bus for a few pics you will not stop laughing about. The PhotoSwagon will pull right up to your venue, or drive on inside if they’ll have it. No room for the PhotoSwagon? We have a booth for you too! Check out our open air photo booth – a trendy, custom option for couples that like to think outside the “box”. Can I come see your photo booth prior to my wedding? Absolutely. Catch the PhotoSwagon crusing around Eugene or give us a call and we will let you know when our next event is. We know there is nothing better than instant gratification; so that’s what we bring you. With each photo booth package, guests receive unlimited prints, which will be in their hands before they can even de-prop or make their way out of the bus. All of our wedding photo booth packages include up to four hours of booth time, an on-site attendant, unlimited instant on-site prints, custom props and photo strips, choice of backdrop, online uploads after the event and a high-resolution digital copy of all the photos and strips. Plus, there are no travel fees for events within 30 miles of Eugene. Can we personalize our photo strips—perhaps with our names or wedding logo? You betcha. We want everyone to have something to take home to remember how awesome your day was. Send us a special wedding logo, or we can help create a personalized photo strip logo just for you. We are a creative, newlywed duo who is obsessed with telling stories and making things beautiful. If you have a special idea in mind, give us a ring and we would love to chat with you about making your ideas happen!